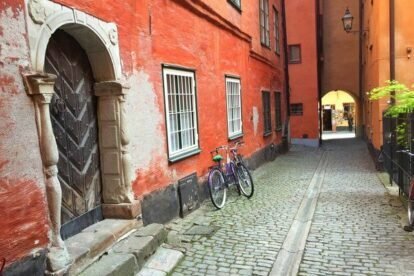 A walk down the blind alley Staffan Sasses gränd in the Old Town, takes one back to medieval Stockholm. The alley runs perpendicular from Köpmannagatan (meaning merchant’s street) one of the oldest streets in Stockholm and first mentioned in 1323. At the end of the alley, at number 8, one finds a wooden door, believed to be from the 1580’s and arguably the oldest door in town. It’s fascinating to imagine all the people who have passed through this door during its some 430-years of existence. If the old door could speak, it could help verify whether indeed this was the one time address of Karin Månsdotter, a commoner whom king Erik IV fell in love with and made his royal mistress before formally marrying her. This was something unheard of during the time and a great scandal. She is said to have had a soothing effect on the insane king (he’d killed a number of noblemen during a fit the previous year) and was one of few persons the paranoid monarch could trust. Karin would end her days in Finland, part of Sweden at the time, a wealthy widow and well liked amongst the local peasants. The fate of her king and husband was death by food poisoning. Arsenic in a bowl of pea soup would become his final meal and forever place him amongst the kings we still remember from history lessons after graduation.